Huge aromas of citrus, grape, kiwi, passionfruit, and resinous American hop intensity spins this wheel! It’s not for a lack of trying.. 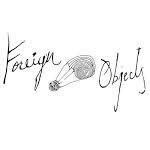 This is a Foreign Objects New-American Hoppy Ale. You can’t trust the God you trusted, so trust our waves of flavor instead… Mosaic & Azacca hops give you what you need to fill your time… . Could you be happy with something else? In this case what we want IS what we get!